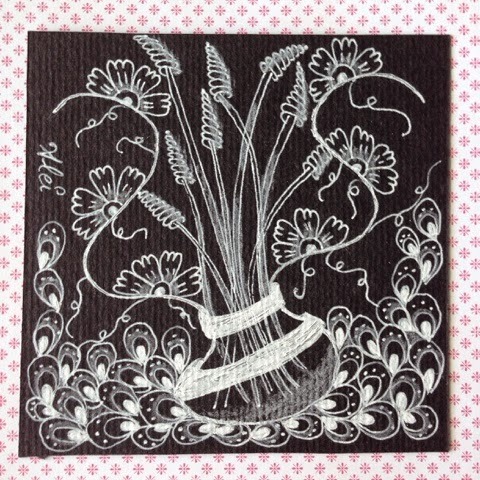 This weeks Diva Challenge #216 is to make a white on black tile or ZIA. I love white on black tiles but I must say I make them rarely. 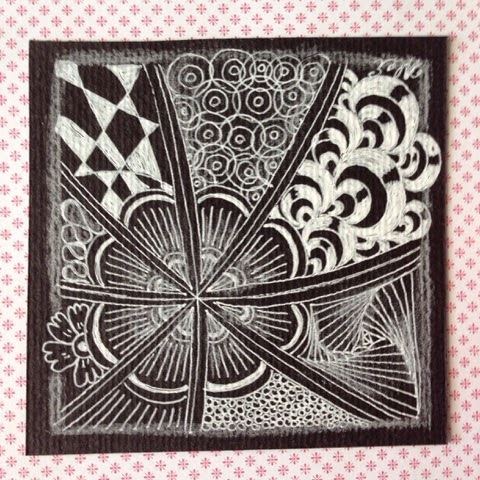 Looking through my collection I see I've even never made a zentangle in 'stadard format '(3,5") in white on black. So, I'll do it this week. I found it far more difficult to make a pattern in white with my gel pen, then with my black pens. Also, I find that 'colouring' in white with the gel gen doesn't give a very smooth result. So, I alway's choose patterns where you don't have to colour a lot, just drawing lines gives for me the best result in white on black. And just adding a bit of white pencil. Here you can see what I made of it. Both are wonderful! Beautifully drawn! very nice tiles! I love them both. Blossoms in each tile! They are perfectly done for the white on black challenge. AND I think the pink background surface really shows them off too! Although I find both tiles very attractive, the first one just jumps out at me. You have combined delicate, organic patterns and made something really pretty and feminine. Nice work.